Orbs as desired. You can get a few thousand Red Orbs every few minutes. approximately 1,000 kills in 15 minutes. Rare Art –1 - Use Devil Trigger 666 times. Rare Art –2 - Accumulate 50 hours of play time (total). Rare Art –3 - Deal a total of 5,000,000 points of damage to enemies. Rare Art –4 - Achieve SSS rank in 60 different missions. a 50 percent score decrease for the current mission. this achievement on the Human difficulty because enemies will die after just a few hits. end of the descent within the two minute limit to get the "A Man With Guts And Honor"
Dante Must Die! 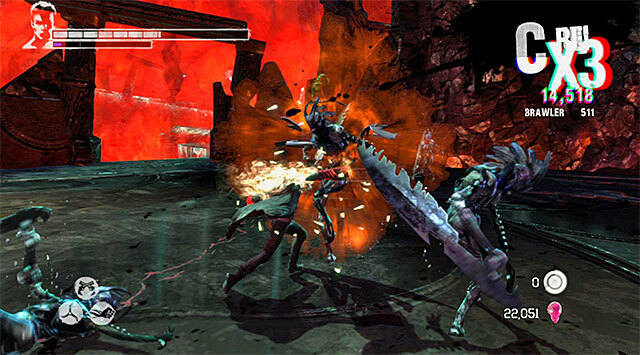 - Complete the game on Son of Sparda difficulty. Heaven or Hell  - Complete the game on Son of Sparda difficulty. Hell and Hell   - Complete the game on Heaven or Hell difficulty. Son of Sparda   - Complete the game on Human, Devil Hunter, or Nephilim difficulty. Son of Sparda  - Complete the game on Son of Sparda difficulty. Standard       - Complete the game on Human, Devil Hunter, or Nephilim difficulty. Super Dante    - Complete the game on Dante Must Die! difficulty. Absolutely crazy about it  - Spend 50,000 Red Orbs. And welcome to Hell! - Complete all missions on the Hell and Hell difficulty. And you are set free       - Free half of the Lost Souls. Bring it on! - Slay 1,000 Demons. Cleaning up his Dad"s mess - Defeat Mundus. Come on Puppy. Let"s go! - Defeat your pursuer. Devils never cry           - Complete all missions on the Dante Must Die difficulty. Dude, the show"s over! - Find all of the Keys. Flock off, feather-face! - Survive the encounter with the Tyrant. For Tony Redgrave          - Kill 50 enemies using nothing but firearms. He"s a demon too           - Help Phineas retrieve his eye. I need more power! - Complete Vergil"s downfall on Son of Sparda difficulty. Impressive                 - Slay 100 Demons. In the name of my father   - Kill 100 enemies using nothing but Demon weapons. It"s showtime. Come on! - Earn 1,500 Style Bonuses. It"s time to finish this! - Help Vergil open the Vault. Let"s rock, baby! - Upgrade Dante"s health to maximum. Let"s welcome chaos! - Open all of the Secret Doors. No talking! - Acquire Aquila. Now my coat"s all charred  - Navigate the Sky Bridge on Mission 16 without hitting the lasers. One hell of a party! - Complete all of the Secret Missions. Sensational! - Gain a SSS Style Rank during combat. Stylish! - Complete a mission with a SSS rank. Thing drives me crazy      - Acquire Osiris. This is my kind of rain    - Spend 10,000 Red Orbs. This is what I live for! - Complete all missions on the Heaven or Hell difficulty. Time to go to work guys! - Purchase your first upgrade. Too easy! - Complete all missions on the Son of Sparda difficulty. We have an uninvited guest - Defeat a Wisp. Whatever, Lady             - Defeat Mundus" spawn. Where does the time go? - Complete a level with 2 minutes or less on the clock. You can"t handle it        - Upgrade Dante"s Devil Trigger to maximum. You don"t belong here      - Defeat an Imprisoner. You"ll never have her fire - Kill 100 enemies using nothing but Angel weapons.